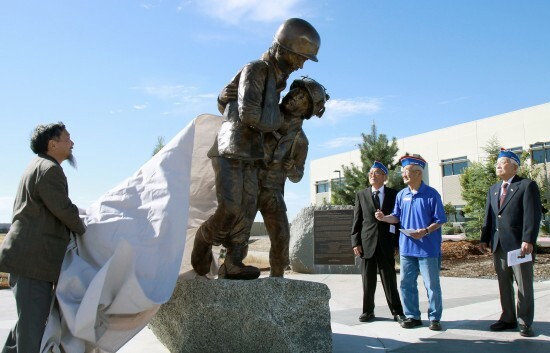 The statue depicting the 442nd RCT’s rescue of the “Lost Battalion” was unveiled last October. For the last four years, I have had the privilege of working on a major historic monument to honor the World War II-era Nikkei (Americans of Japanese Ancestry) of Placer County, which includes members of my own family. I have always wanted to do something that would honor that generation, which contributed so much and inspired my success. My generation (Sansei) owes much to our pioneer immigrant grandparents (Issei) and American-born parents (Nisei). They instilled in us the Japanese work ethic, prodded us to pursue higher education, and encouraged us to become solid citizens and leaders in our communities. In 2009, the Placer County Board of Supervisors approached our local chapter of the Japanese American Citizens League (JACL) with plans to develop a memorial to honor the 442nd Regimental Combat Team. We agreed to form a private/public partnership. More than 100 Nikkei from Placer County served in the 442nd. Many of these American Japanese who fought so valiantly to defend our country endured, along with their families, the hardships of internment and relocation camps. In the first phase, Placer County completed a landscaped area around a compass symbol, symbolizing the broad reach of the Nikkei effort in World War II, and two plaques describing the memorial set into large granite boulders. At the on-site dedication on Dec. 16, 2009, the county named an intersecting street “Go For Broke Road” in honor of the motto of the 442nd. Placer JACL began fundraising in 2009, and through generous donations from individuals and businesses, we managed to commission a larger than life-size bronze sculpture, along with other amenities, that enhance the site. The completed memorial is the culmination of our four-year effort. The bronze monument shows a member of the 442nd rescuing an injured member of the Texas regiment that had been trapped for days in a fierce battle against Nazi troops in October 1944. It honors not only the Nikkei soldiers of the 442nd RCT, the 100th Infantry Battalion, and the Military Intelligence Service (MIS), but also their families who remained behind in internment camps, deprived of their constitutional rights due to their nationality and ancestry. The memorial completes an ironic cycle in history. Placer County was once considered the fruit bowl of the country, shipping fresh pears, plums, and peaches to the rest of the nation from packing sheds in Roseville, Loomis, Penryn, Newcastle, and Auburn. A majority of this fruit was grown by Issei and Nisei farmers. Even before the attack on Pearl Harbor, California was a hostile place for Japanese Americans. After the attack, Placer County was one of the most hostile places of all. On the West Coast, persons of Japanese ancestry, 120,000 of them, were forcibly removed from their homes and their farms, incarcerated, and held in desolate places like Tule Lake, Calif., and Amache, Colo.
Once the war was over and they were permitted to return, the hostility was greater than ever. Returnees were greeted with “No Japs” signs on businesses, and former friends refused to acknowledge them. Now, 70 years later, with the passage of time and the easing of emotions, we are honoring these courageous men and their families with an awe-inspiring monument at the Placer County Justice Center in Roseville. I am humbled to be part of this project. I thank those who have supported our project and hope that each one of you will come out and help us dedicate our monument. The ceremony will be held Sunday, June 2, at 2 p.m. at the Bill Santucci Justice Center, 10820 Justice Center Dr., Roseville. For additional info, please call (530) 888-1303 or go to www.placerjacl.org. To Ken Tokutomi: Our thanks for taking the leadership in bringing the Japanese American Memorial to completion.You have completed a monumental task; our thanks. After the battle, the unit was decapitated because of the tremendous lose of men; many complained that the unit was used as sacrificial unit as the Texas unit had its own reserve unit to use. Placer County had a total of 116 men serve during the WW II, of which 49 men served during the Battle of the Lost Battalion; passage of time has taken its toll as only 4 men are alive today. Ken Tokutomi has also served a leader of other organization including Salvation Army and its annual Thanksgiving dinner, leading the commitee for formation of a new high school at Forest Hill, and served in numerous position with the JACL. The Nikkei of Placer County are truly greatfuf and thankful for all that you have done for Placer County.